March 2005, Volume 2 Issue 3 Know It - Profit! This month's Chart Wealth has a new look and feel. I've added a section called the Broad Market which will highlight different economic indicators in each issue. Also, I'm going to expand the chart coverage to include: treasuries, mutual funds, commodities, exchange traded funds (ETFs) and currencies. I think you'll enjoy the changes. This month we'll get a pulse on the major market indices. 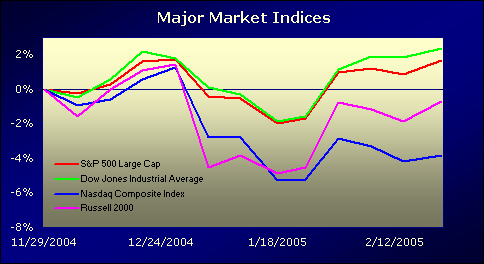 Let's focus on the Dow Jones Industrial Average, S&P 500, Nasdaq Composite and Russell 2000. All have turned up within the last week... but, only the Dow and S&P 500 are in the black. Taking a closer look, the Dow Jones Industrial Average seems to have recovered from its stumble earlier this year... or, has it? Right now, there are three dynamics working against a move higher. First, there is the Bearish Divergence which has built-up over the last year or so. Next, there is a possible Double Top. A move below 10,300 will confirm the pattern and possibly take the index down to the 9,700 area. Finally, there is a Hanging Man candlestick pattern that is applying some selling pressure. Some sectors from last month remain strong. The AMEX Healthcare Payor and the PHLX Housing Sector continue to perform, well. 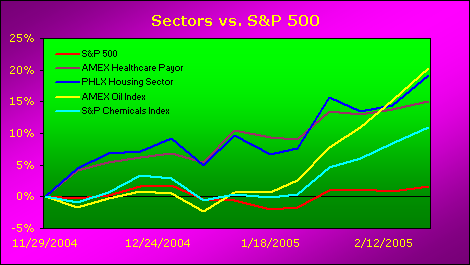 Two new sectors which made the grade are the AMEX Oil Index and the S&P Chemicals Index. 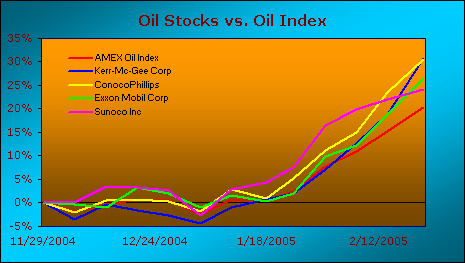 The AMEX Oil Index is at an all time high... not surprising since crude oil is doing the same thing! However, be cautious. 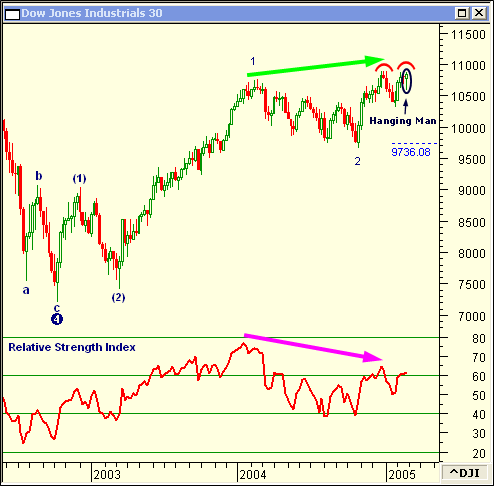 With the sharp, sustained move up and momentum waning, a correction is not far off! These stocks really got into gear in mid-January and took-off! Kerr-Mc-Gee Corp, ConocoPhillips, Exxon Mobil Corp and Sunoco Inc all had awesome gains within the last month. Yes... but, not before a corrective move down. 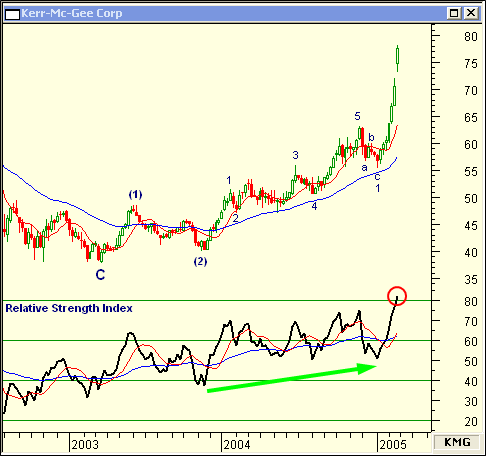 Currently, KMG is in a strong Wave (3) move up. 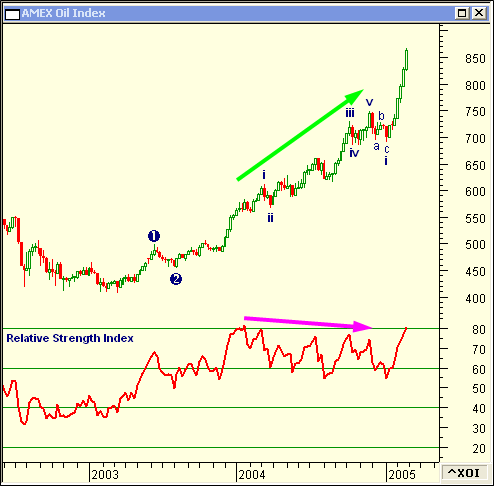 The Relative Strength Index (RSI) is in positive territory... reading above 80. The RSI Moving Average has just turned bullish, confirming the power of the current wave up. I expect a bullish performance from KMG and other oil stocks... lasting through the summer. In the January 2005 issue of Chart Wealth, I said MGM Mirage Inc (MGM) would climb to $74.50, correct down to its long-term trend line and then, make another push to new highs. The casino stock did just that! MGM (View Chart) traded-up to near $77 before correcting down to within two points of the trend line. Recently, it has jumped to a new high at $79.60 and is back down to the long-term trend line... poised for another reversal-up! The power of Relative Strength Comparison charting is in its simplicity - it cuts through the market chatter, bringing the true front-runners into focus. Use relative strength comparison charting as your first step for selecting great stocks... ready to move!